HAVANA — Making good on his deal with Sen. Marco Rubio (R-Florida) and Rep. Mario Díaz-Balart (R-Florida), President Donald Trump announced Friday that he plans to roll back some of the steps Barack Obama took to normalize relations between the United States and Cuba. In 2015, Obama weakened restrictions on Americans traveling to Cuba and eliminated some of the economic prohibitions between the two countries. He removed Cuba from the list of state sponsors of terrorism and loosened the export of US internet hardware and telecommunications. He also set up increased cooperation in intelligence-gathering, drug interdiction, scientific research and environmental protection. Obama made it easier for Americans to travel to Cuba. Nearly everyone can now visit Cuba without applying for a specific license. US airlines can fly there directly with cheaper fares; only general licenses are required for most travel to Cuba. In his Presidential Policy Guidance on Cuba, Trump reinstituted some restrictions on US travel to Cuba and US business relations with the island. He did not touch Obama’s loosened limits on Cuban-American travel and remittances to Cuba, however, because that would anger a significant voter base in Florida. Trump also left in place the US embassy in Havana and the Cuban embassy in Washington, DC, that Obama established. And Trump did not end direct flights to Cuba by US airlines. On June 1, Engage Cuba released a report concluding that a reversal of Obama’s Cuba policies could cost the US economy $6.6 billion and affect nearly 13,000 jobs during Trump’s first term. Obama’s 2015 policies have led to significant economic growth and job creation throughout Cuba. So much for the dealmaker-in-chief’s commitment to creating jobs. René Esquivel, who sang with the Buena Vista Social Club, is a bellhop at the Havana Libre hotel. Esquivel told Truthout he couldn’t believe Trump would jeopardize the US economy to the tune of $6 billion. Darian Hernandez Rojas, a Cuban law student at the University of Artemisa, concurs. Cuban law professor Gabriela Torres Romulo, who teaches at University of Holguín, informed Truthout that increased currency from tourism helps Cubans because there is more money in the country for social programs, such as education, health, culture, sports and scientific research. Cubans who run private restaurants called “paladares” and Airbnbs will be hurt by Trump’s crackdown. “In short, many Cubans believe that the Trump administration’s new policy will hurt those it is ostensibly meant to help: the average Cuban who has struggled under the weight of a battered economy for decades,” according to the New York Times. Last year, the US and Cuba signed a bilateral agreement to respond to oil spills and hazardous pollution in the Straits of Florida and the Gulf of Mexico. Since Obama’s détente with Cuban President Raul Castro, US airlines, hotel chains and cruise ship lines have started doing business in Cuba. Agricultural producers in Kansas and Louisiana have exported tons of goods to Cuba. And Cuban people have obtained access to the internet. According to a Pew Research Center poll, 75 percent of people in the US support the policies Obama instituted. Those changes have created jobs and income for the US economy. Last year, more than 60,000 Americans visited Cuba, an increase of 34 percent over 2015. US airlines and cruise lines now travel directly to Cuban cities. “Airbnb also now lists hundreds of privately owned houses where open-minded Americans can stay and interact with locals, and last week it said its connections have helped place $40 million in the pockets of Cuban owners of private bed-and-breakfasts,” Christopher Sabatini wrote in a New York Times op-ed. Since 2015, individual Americans have been able design their own trips under “people-to-people” educational exchanges that no longer need to be organized by a US organization. Under Trump’s new rules, Americans must qualify under one of 12 permitted travel categories. The Trump administration will also tighten enforcement of travel under the authorized categories. These categories include professional research or attendance at professional meetings relating to the traveler’s profession, professional background or area of expertise; educational, religious, humanitarian, journalistic, athletic or artistic activities; visiting a relative in Cuba; support for the Cuban people; business visits for exchanges of information, telecommunications and Internet hardware and software, and exportation of agricultural products and building materials; foundations, research or educational institutions interested in international relations collecting information about Cuba; and official US government business, including visits to Cuba by foreign diplomatic staff residing in the United States. Trump’s order prohibits American travelers and businesses from participating in financial transactions with entities owned or largely controlled by the Grupo de Administración Empresarial SA (GAESA), a holding company run by the Cuban military, which poses no threat to US security. Now Americans will be barred from spending money in state-run hotels or restaurants connected with GAESA. “This is a new way to enforce the old embargo,” John S. Kavulich, president of US-Cuba Trade and Economic Council, told Politico. He says about 60 percent of the Cuban economy and 80 percent of Cuba’s tourism economy are controlled by GAESA. The new rules will not apply to travelers who have booked trips or to business deals already concluded with the military. But Americans will be barred from staying at new properties such as the Gran Hotel Manzana, which is managed by Kempinski Hotels but owned by Gaviota, a Cuban military-run company. Trump wrote that his policy “will be guided by key US national and security interests and solidarity with the Cuban people.” His changes, however, have nothing to do with national security and will only hurt the Cuban people. “We must ensure that US funds are not channeled to a regime that has failed to meet the most basic requirements of a free and just society,” Trump’s directive says. Trump’s rollbacks of Obama’s policies are ostensibly aimed at improving human rights in Cuba, which is curious in light of Trump’s treatment of “human rights considerations as an impediment to trade and partnerships that create jobs in the United States,” Julie Hirschfeld Davis wrote in the New York Times. “given [the Trump administration’s] complete lack of concern for human rights around the world, it would be a tragic irony if [they use] that to justify policies that harm the Cuban people and restrict the freedom of Americans to travel and do business where they please,” Benjamin Rhodes, former deputy national security adviser to Obama who negotiated the 2014 deal with Raul Castro, told the Times. For example, Trump is enamored of Saudi Arabia. Critics of the Saudi government and clerics have been tortured, beheaded, crucified and lashed. Even lawyers who question government policy are imprisoned. In spite of its egregious human rights violations, Trump sold a record $110 billion in arms to the monarchy. In fact, Cuba has surpassed the United States in its guarantee of economic, social and cultural rights, which constitutes a category of human rights under the International Covenant on Economic, Social and Cultural Rights. Cubans enjoy universal health care, free education, equal pay rates and paid maternity leave. Unlike in the United States, health care is considered a human right in Cuba. Universal health care is free to all. Cuba has the highest ratio of doctors to patients in the world at 6.7 per 1,000 people. The 2014 infant mortality rate was 4.2 per 1,000 live births — one of the lowest in the world. In Cuba, free education is a universal right up to and including higher education. Cuban law guarantees the right to voluntarily form and join trade unions. Unions have the right to stop work they consider dangerous and the right to participate in company management. Women make up the majority of Cuban judges, attorneys, lawyers, scientists, technical workers, public health workers and professionals. As of 2018, the date of the next general election in Cuba, there will be a limit of no more than two five-year terms for all senior elected positions, including the president. Anyone can be nominated to be a candidate. But Trump’s cutbacks really constitute a thank you to some Cuban-American lawmakers for their support of his policies, including repealing Obamacare and shielding the president from consequences for his malfeasance. Notably, Rubio’s questioning of former FBI director James Comey during the Senate Intelligence Committee hearing was designed to undercut Comey’s testimony that implicated Trump in wrongdoing. “I am confident the president will keep his commitment on Cuba policy,” Rubio declared after the hearing. Trump’s rollbacks of some of Obama’s Cuba policies were developed during several meetings between the president and Rubio. Obama was unable to lift the longstanding US economic blockade of Cuba because Congress passed the Helms-Burton Act in 1996, which codified the blockade so that only Congress could revoke it. 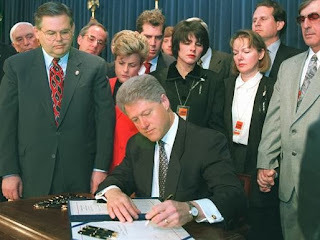 Díaz-Balart’s brother, Rep. Lincoln Díaz-Balart, was instrumental in securing Bill Clinton‘s signature on the Act. The US embargo of Cuba, now a blockade, was initiated by President Dwight D. Eisenhower during the Cold War in response to a 1960 memo written by a senior State Department official. The memo proposed “a line of action that makes the greatest inroads in denying money and supplies to Cuba, to decrease monetary and real wages, to bring about hunger, desperation and the overthrow of the [Castro] government.” That purpose was never realized. The US blockade has hurt the Cuban people. They are unable to obtain equipment to test pregnant women for birth defects and medicines for children with liver disease. Cubans are also denied access to life-saving medical equipment, such as kidney dialysis machines, and antibiotics. Moreover, the blockade also hurts people in the US. Cuba has developed pioneering medicines to treat and prevent lung cancer and diabetic amputations. Because of the blockade, however, we in the United States cannot take advantage of them. Esquivel joked that when Obama was president, he used to call Esquivel every day and tell him to “take care of my people.” But when Trump became president, Esquivel quipped, Trump called him every day and told him to be on the lookout for Americans who come to Cuba against the blockade, gather their particulars, and send them to Trump so he could arrest them. Trump has no feeling for what it means to be human, Esquivel added. 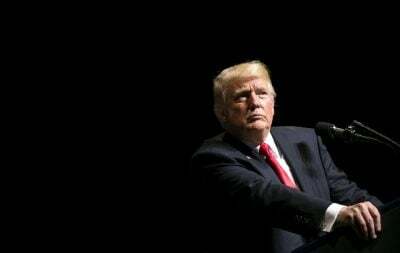 There is a long history of friendship between the Cuban and American people that neither Trump nor anyone else can destroy, according to Esquivel. He suggested that one of the most significant cultural/historical exchanges between the two peoples would be for the US to help Cubans repair the vintage US cars some still drive. It’s not an economic issue, Esquivel said, but would be an important cultural interchange between the two countries. Trump is threatening to undermine years of concerted effort — inside and outside of government — to establish a civil, peaceful coexistence with an island neighbor after more than a half century of intervention, embargoes, and assassination plots. At stake is a model of responsible US foreign policy — to be emulated, not repudiated. Most people in the US, including 6 in 10 Republicans, favor expanded travel and trade with Cuba. 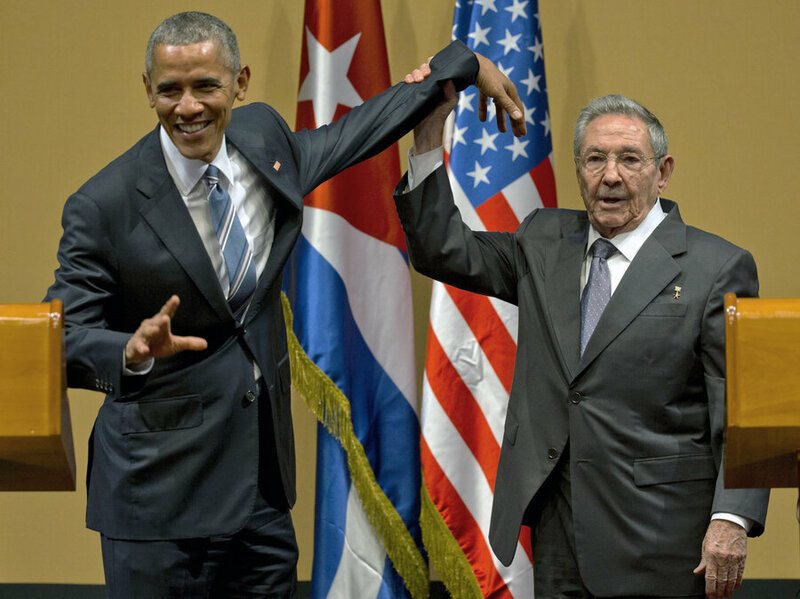 A new Morning Consult national poll found 65 percent of US voters support Obama’s Cuba policy. Sixty-four percent of Republicans support relaxed travel and trade restrictions. And 61 percent of US voters favor a total end to the blockade. A Florida International University biannual poll published in September 2016 found that 63 percent of Cuban-Americans in Miami-Dade County, historically the center of opposition to engagement with Cuba, support lifting the blockade. Esquivel said Cubans love Americans. But of everyone he has encountered from the United States in the course of his employment, not one supports Trump’s policies. In order to establish complete normalization of relations, Cuba would require lifting the blockade and returning Guantánamo to Cuba. Trump’s new order is a step backward, not forward. The future of real progress toward normalization of US-Cuba relations, which will help people in both countries, lies with Congress. Several bills have been introduced in the legislature to challenge the blockade. The Freedom for Americans to Travel to Cuba Act (S.1287) would guarantee Americans the right to travel to Cuba. The bill already has 55 co-sponsors, including nine Republicans. Legislators respond to public pressure. Calls, letters, emails and demonstrations aimed at improving the United States’ Cuba policy can be most effective. Contact your congress members and demand that they vote to lift travel restrictions on Cuba and end the US blockade.